Chinese compounder Kingfa Sci. & Tech. Co. (Guangzhou) has been supplying polyamide 10T for several years now. Its Vicnyl semi-aromatic resin features better resistance to hydrolysis compared with PA 9T and PA 46 and employs a naturally-derived monomer. 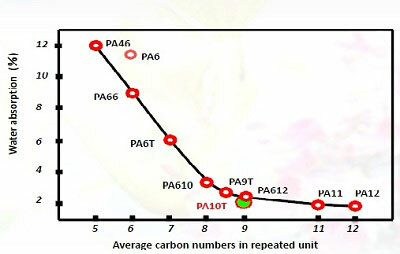 PA 10T is based on decanediamine, a renewable raw material derived from castor beans, and terephthalic acid. 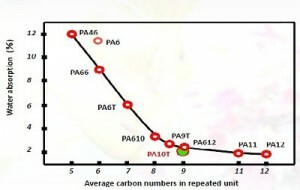 The bio-based carbon content in Vicnyl ranges between 40%-60% by weight. The polymer is produced at a 2000-tonnes/yr plant. “Thermal properties are superior to both PA 46 and PA 9T says Patrick Xu,” sales supervisor for South China. Better tensile strength and flexural modulus retention in hot water is also evident from tests, while dimensional changes are also smaller. Other advantages are said to be low warpage, high melt flow, and smooth surface finish.